Is there an easier and cheaper way to update your space than getting creative with a bit of paint? Sure, you could paint a whole room, or go for the feature wall, but why not try something a bit different? For even more advice and inspiration, take a look at our paint hub page. For the full low down to how to DIY an ombre wall, check out our step-by-step guide. With a load of different patterns and designs available, stencils are a surefire way to add a ton of interest to an otherwise plain wall (or floor even). Plus they are super cheap and you usually don't need too much paint, if you looking for a budget friendly update. Check out @fwmadebycarli who used stencils on her hallway flooring to give the effect of tiles. Nifty! Find out more about painting floorboards in our guide. Just before you get started make sure you check out our step-by-step guide to how to paint furniture to make sure you get the best results. Or why not just add a splash of colour by painting sections of your furniture. We love what @grillodesigns has done with this basic TV console. So simple but super effective. You could even paint your furniture the same colour as your walls, this is a nifty trick for stopping larger pieces overwhelming a small room. We definitely have a tendency to ignore our ceilings when it comes to paint: we play it safe, painting them in various hues of greige. But we reckon we should start being a bit bolder by painting them in a bold colour, or even just a different colour to your walls. Inspired to give your fifth wall some attention? Read our guide to how to paint a ceiling. Simply put, colour blocking is the pairing of two or three totally different colours to make a bold statement. You can do it on any scale and customise it to suit any colour scheme. Just look at these inspiring ideas below and check out more colour blocking design ideas in our gallery. Colour blocking needn't always be super out there, here Farrow and Ball India Yellow has been combined with a touch of black and a bright clean white to create an alternative feature wall. Outdated tiles can be a major drawback in a kitchen or bathroom and while replacing them with something more contemporary is the most obvious option, painting your tiles can achieve a similar effect. 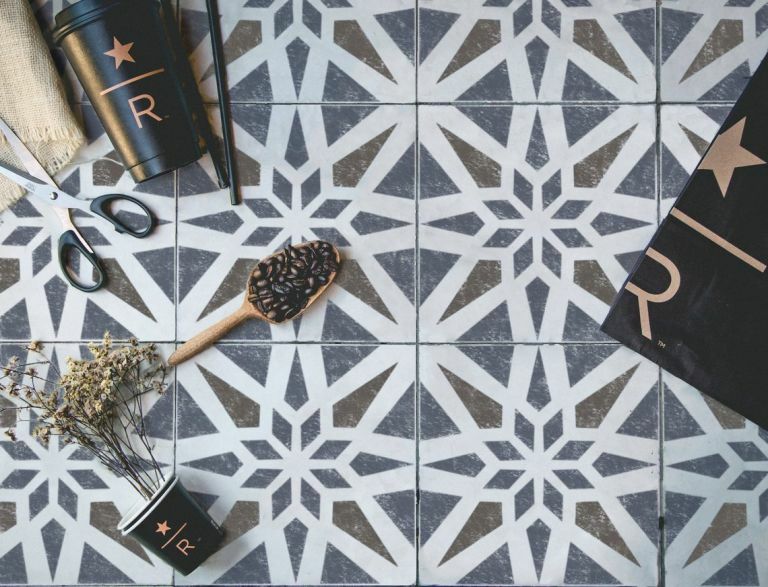 It's a big trend on Pinterest, and we love the idea of using tile stencils to transform the look and feel of a tired looking space. This Modern Geometric Tile Stencil from Etsy is one of our favourite examples. Like this idea? Our guide to how to paint tiles will talk you through the process, step-by-step. If you'd LOVE expensive looking floor tiles but are having to make do with pine floorboards, if you're looking for a quick, practical update for a room you don't want to spend lots of money on, or if you just want to create a unique look for a room, painting floorboards is a fantastic option. Easy to do, it's affordable, too. Find out how to paint floorboards in our guide. Want more painting and decorating advice?